Currently running on Kickstarter is The Absentee #1 from Inverse Press. Unlike most Kickstarter projects, The Absentee is already completely finished, it just has to be printed. With the Kickstarter already achieving its funding goal, it’s an almost certainty that the book will see print, but there’s still plenty of time to claim various rewards and get behind making this scifi/horror comic happen. As part of a quest for perpetual energy, test pilot Coy Blackler embarks on an interdimensional quest. Before he can make it back from this other dimension though, he’s possessed by an immaterial demon. With time, Coy learns to control the demon with his own consciousness, but while he’s away in the demon’s body, the demon is controlling Coy’s own body and using it to wreak havoc. Writer Kevin LaPorte quickly establishes how seemingly likable Coy is. He has an unloving wife and a cruel boss who seek to get Coy out of the way, while Coy only wants to impress. Seeing him used and abused makes the reader root for him, especially once he’s taken over by a demon and even further toyed with. Artist Randolph Dixon gives Coy and his struggles a sleek look, especially the futuristic tech used to propel him to another dimension and the demonic inhabitants of said dimension. His looks of anger and agony that so often flash across the face of coy and some of the other characters are spot on, conveying emotion very well. It’s a story of a man’s struggle to do good, while it seems everyone is scheming against him. Coy gets continually screwed over, so it should be incredibly interesting to see him start to fight back a bit once he learns to harness the demon’s form. 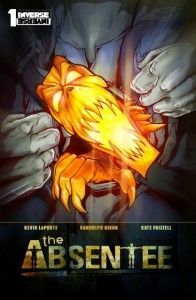 If The Absentee sounds like something you’d like to check out, then head on over to Kickstarter. If you don’t act now, you may not be able to get a copy for some time. Thanks for taking the time to read and review our work, guys! Sharing the link all day today!